It has been snowing up north in Calgary. 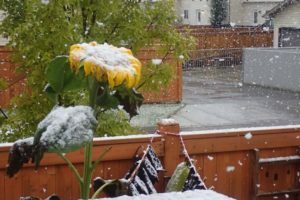 White stuff on William’s sunflower. One of the great joys of Autumn is the dusting off of the old trusty crack pot. I picked up the makings for a beef stew and I think that today is the day for that. A real Sunday dinner is happening. Catherine said they have plenty of cucumbers so will run over there and grab a few for slicing. Yses, Catherine and Dana are back to the Island after their Pilgrimage to Dales Way, England. They will be here for the Tuesday afternoon walk and tapas so we will get the report in full for you. Yes, all is right with the world with them back to the “Rock”! Oh, there is the waning moon in the blue sky just for me. Well, it is not just for me but maybe… Little puff clouds are marching across the sky and the sun is coming and going. All very exciting. There is moisture at higher elevations but I think that it will be dry here today. We had a little rain overnight though, perfect for my little itty bitty clover seeds that I planted. Ouch, a bird just flew into the window as I watch the moon. Hmm, plenty happening here at the moment in my natural world. Time for me to move around in it. Thinking of you, joyful thoughts. Life is a poem loves, Felipe. Sybil and Mary at the halfway sign a few days ago. Sybil and Mary are a couple of folks from here on the Island. We had a sendoff party for them maybe a month ago. So some pics have come in making their progress, the latest being Leon. It feels good to think about all that from my armchair. What a bunch of work, right? Hehe anyway, What is on the schedule for today? We got Autumn coming here and trying to get all the chores done that relate to that change. 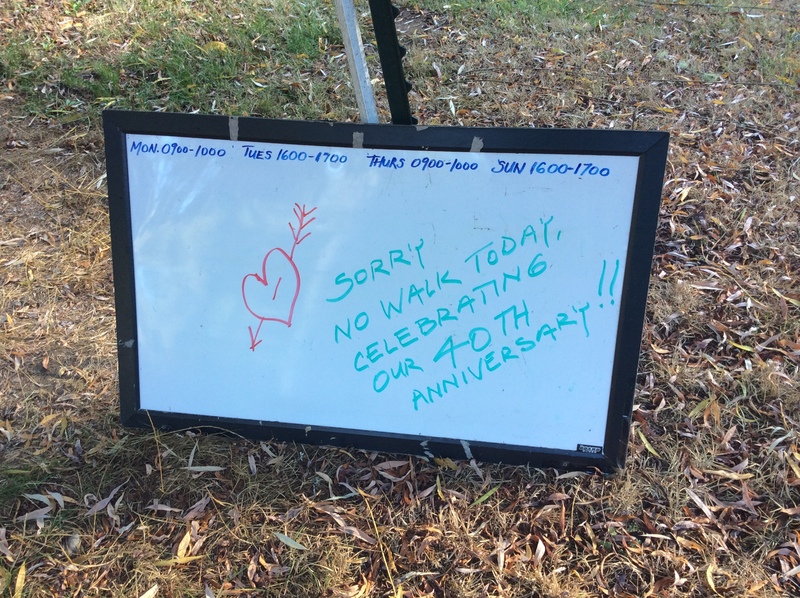 Visitors are still coming to walk on the trail. BLT’s are prominent on the menu with ripe tomatoes in abundance. 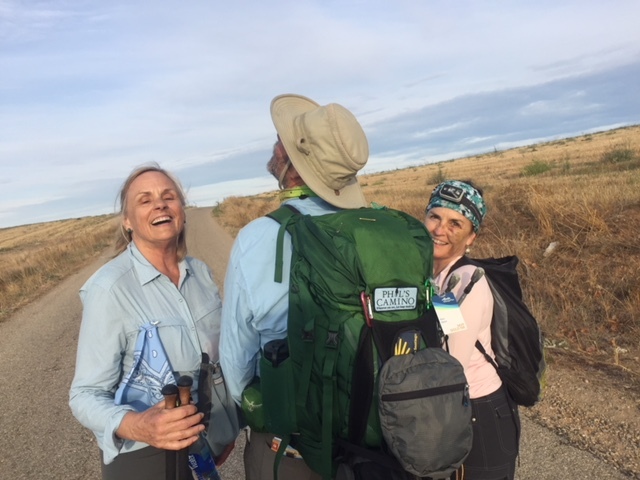 There is talk of having a getogether next summer for as many Caminoheads as can make it. Just starting to put together timing and logistics. Stay tuned for details on that. This is exciting stuff. Also just following this post I am going to put up the walking schedule for the rest of September and October. There are quite a few days in October that I will be absent and the trail will be closed. Want you to be aware. Catherine y Dana, major players in our neighborhood are winging back from England after their pilgrimage there. We missed them so. We will come up with a report on Dales Way for you in the next few days soon as they are ready. OK, you guys are the best ever. Keep in touch, more good stuff to come loves, Felipe. I have a pile of books here on the coffee table next to me. Actually a pile would be a big compliment, more like a sprawl. I just noticed the similarities in the covers of two books that happened to have wound up next to each other. 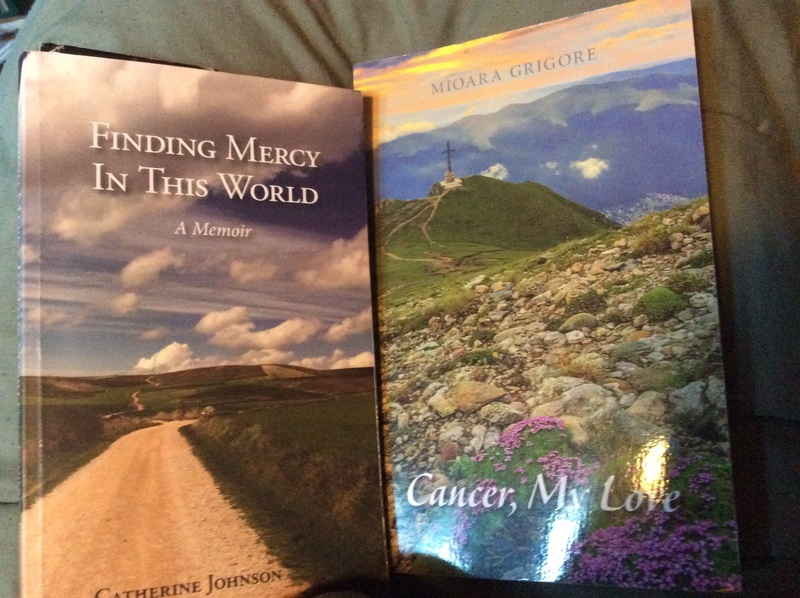 One is Our Catherine’s Finding Mercy in this World and Mioara Grigore’s Cancer, My Love. And this has happened before with Catherine’s book and another so it is grabbing my interest. All three have a landscape with the trail going off into the distance. Each a little different but have something important in common. We recognize and respond. We are drawn in. We are happy seeing a trail! There was some great comments yesterday, weren’t there? You guys are all awake and willing! I’m happy. Geez, we could spring board in so many directions. But what I am seeing first is what Cris said about we all needing each other. Yes, for sure. And just the same there are times when as Jessika pointed out where we need to work on our interior stuff. Not in a way to escape from being together but to clarify our vision, so to speak, so we can come back stronger. I feel like I am turning from the Tom Sawyer to the Henry David Thoreau of the Camino. 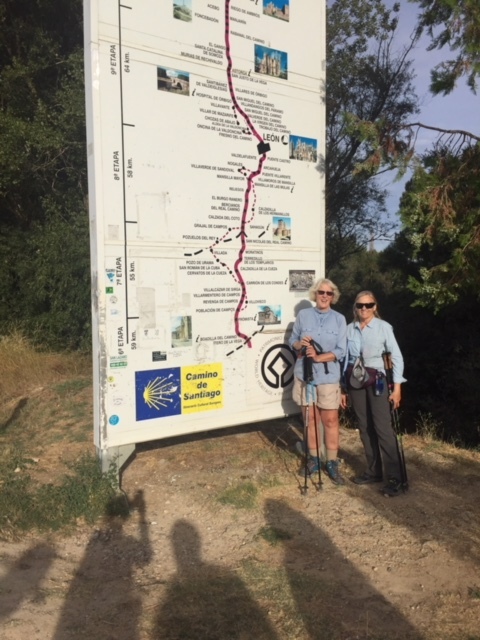 I spend years now cheerleading and hopefully getting people excited about walking the main Camino in Spain and then now to moving to alternatives to alleviate the crowding. The Camino is suffering from it’s own success. But it is all wonderful really, so many attracted. But we are starting to see alternatives appearing where the same lessons my be available or other valuable lessons my be had. And maybe some of these walks are close by and don’t require jet fuel. Maybe we don’t have the time, money or health to pull off a far away extended trip but can prosper from something close by just the same. The happy pilgrim. Thanks William. 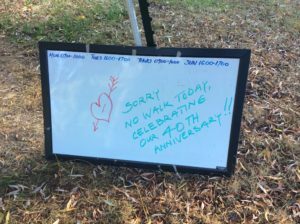 “On the contrary, the neighbourhood is 100% needed to be a pilgrim. A pilgrim alone is not a pilgrim, maybe it is a solitary walker (or a “walking pilgrim”). What we need to be pilgrim are the other pilgrims. The other pilgrims make us be better pilgrims, and viceversa. And I think I could share the wisdom of Fr. Ruben, the priest at the church where I went to school; he loves language and likes to explain the etymology of words, and he said that “Benevolent” comes from the Italian “Bene=Bien” – “Vole=wish to do”, so someone benevolent is someone who wants to do good to others, therefore, the others are needed to express our best qualities. Generosity is nothing if there is nobody giving us the opportunity to be generous, and I could go on. Right Michele, I hope that we aren’t on some deep thought rabbit hole. 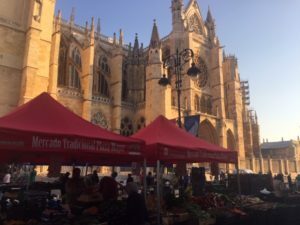 I think that it is important to link to history and to get some idea about what we are doing being pilgrims functioning off of the traditional pilgrim routes. Off to walk here at Phil’s Camino. Off the beaten path loves, Felipe. A friend, Joby, put up something interesting on FaceBook and I bit on it. It was something like International Book Week and you were supposed to grab the nearest book and go to page 52, the fifth sentence, and post that sentence with the instructions for the next person. Some interesting sentences came up amongst friends. And you know how recently we have been kicking around ideas about expanding the definition of pilgrimage. 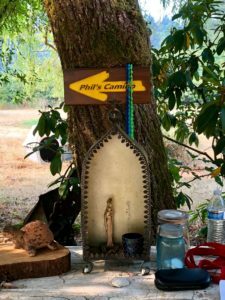 We talked about including Phil’s Camino in the realm of pilgrimage even though it has no “real” destination. We had so stretched the definition of Camino to the point of being on the verge of it becoming a state of mind. 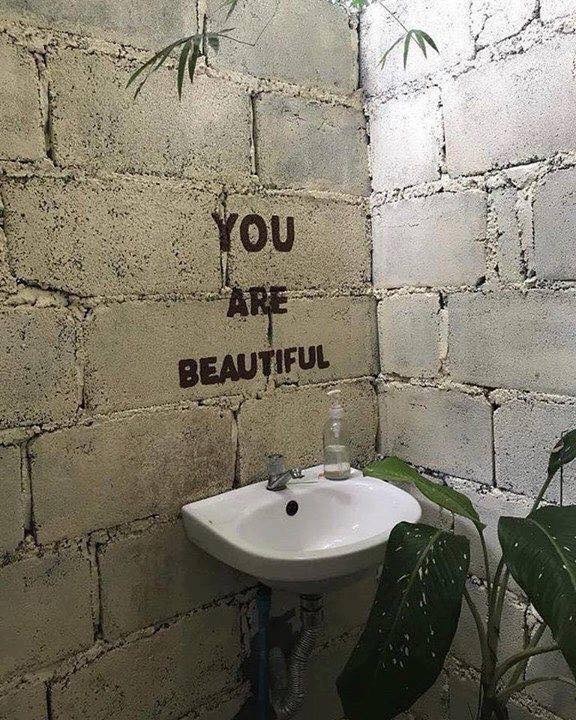 That’s a good thing to me. So with my mighty Latin skills I am interpreting that to mean that the pilgrimage to holy places started in the fourth century and before that was something different. And that was the ascetic pilgrimage, whatever that was. That sounds challenging if not sorta grim. But the important thing is that there was something different and it looks like it was happening locally inside or around the monastery, sans destination. So, that is what I ran into recently. Had to work around all the partying that has been going on. Oh, and my scan report came back “stable” meaning no growth of my tumors. That is good news. God has me where He wants me these days. No “Get Out of Jail Free Card” but none the less I am left with something challenging but doable. Thanks for all your thoughts and prayers. No one has support like I have. It is unbelievable powerful. Thank you one and all. Camino shot from Robert Laturno. Good one! Hey, a great new thing has happened! My spell check came through and invented a great new word., HEARTSHIP. What do you think? I think we can work with it. It must be defined something like the state of having heart, right? Yea, I was trying to write the word hardship and heartship was substituted. A thousand times this is frustrating and then once it coughs up a gem! Speaking of that, I myself need to cough up a gem later this afternoon. Have a scan this afternoon to check out my insides and could use some good news from way in there. Pray for me just a tenth of a second. 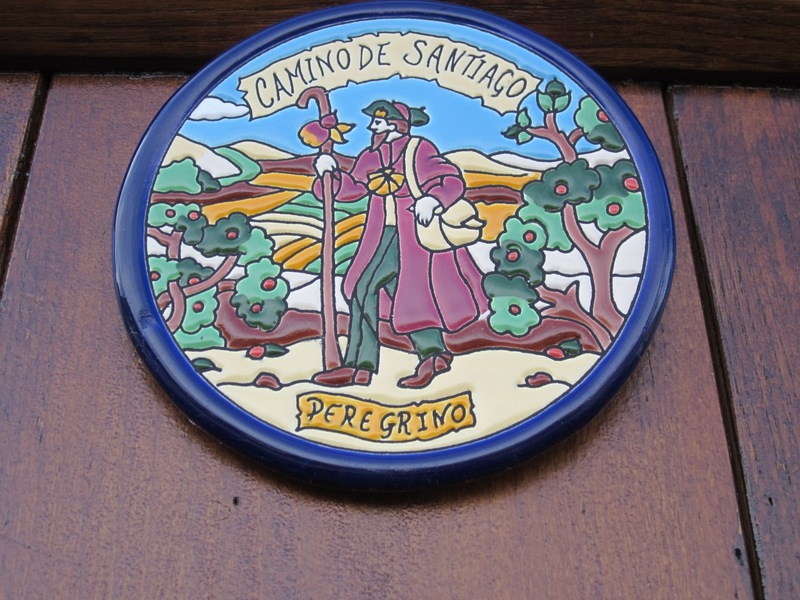 We have been talking for years about the Camino, pilgrimage, walking and related issues. It happens quite a bit here at the blog that just when I think I am dry for inspiration, something new comes appears to work on. 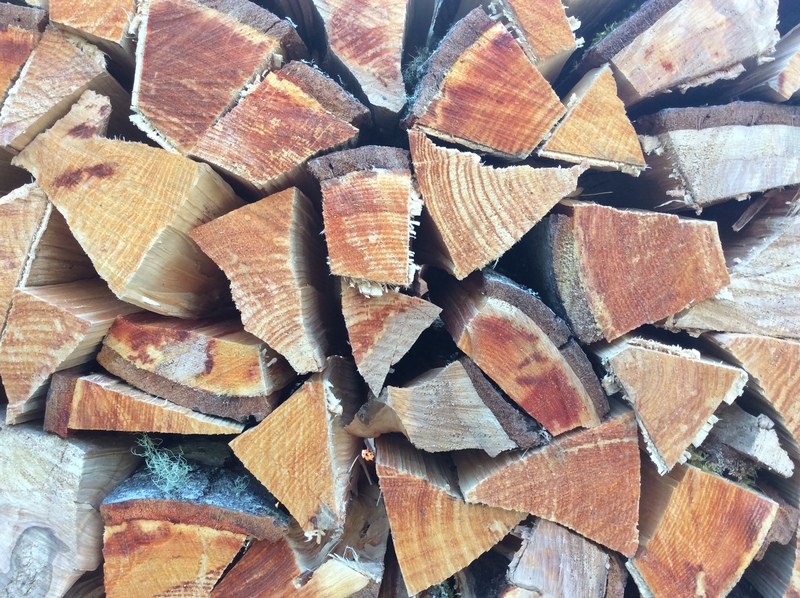 Somehow had this image come to mind of us walking, of moving forward, of accumulating experience, of being together as “walking into the bigger picture”. I like it so much. That is really what we are doing. Yes, I think we can work with it. Well, time to shower and get the tractor dust off me for my hospital visit. See you soon. Maybe send a note to My Rebecca wishing her a Happy Birthday. OK, heartship loves, Felipe. Sorry no walk today. Celebrating our 40th Anniversary!! Just a slight hangover this morning after so much celebratory activity yesterday. It was our 40th anniversary and also My Rebecca’s birthday tomorrow Tuesday. It will be her 70th, oops, can I say that? Anyway, we went into Seattle with Wiley and Henna and Ubered around to things with the young folks “handling” the old folks. There is a huge ferris wheel on the waterfront in town that My Rebecca wanted to go on since she thought her skydiving days were over. That was cool and the evening was perfect for sight seeing from beautiful weather. Then we went to our fav restaurant The Phoenicia at Alki Point. We first went there in ‘03 after we returned from our fabled Med cruise and the discovery of Malta. Alperfect, the whole deal. Walking in a few minutes and that will for sure shake the last of the hangover out of me. Shades of a few mornings in Spain, just a few. 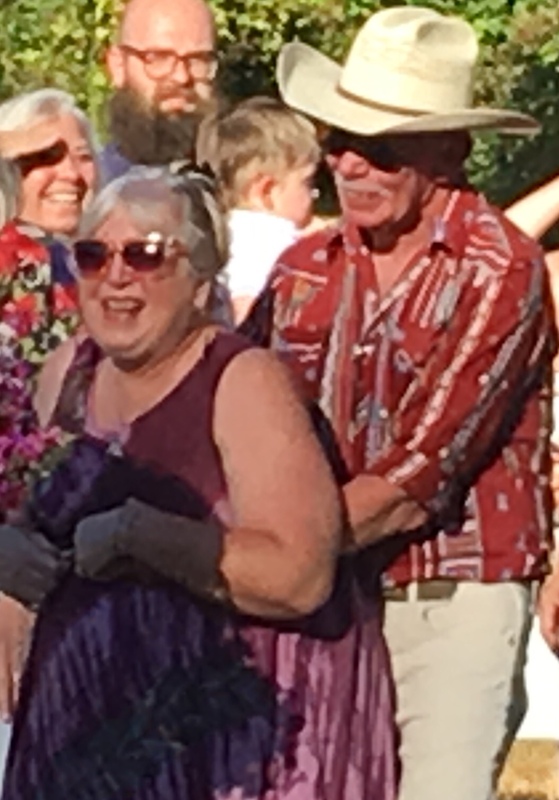 At Wiley and Henna’s wedding here in August. 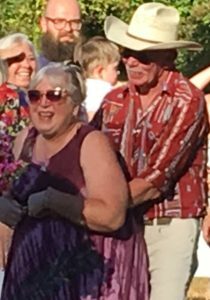 Forty years ago today My Rebecca and I got married. Yea. And we had the privilege of raising two great children and we are happy about our two wonderful grand kids. We have wrapped a lot of Christmas presents and hidden a lot of Easter eggs in those years. Time has seemed to have slipped by pretty easily. We are off to Seattle later today to celebrate with Wiley and Henna. At church, Father Fred was with today. He is the cousin of our regular priest Father David. Their styles are so different, it is fun to have them both. So, the homily was about how we are all the body of Christ, us all the individuals who believe in Him. We make him present in the world. We are His hands and feet. And Father went on to talk about the idea that we talk about how we are supposed to buoy each other up in this world. Well those are my words, to buoy up. But he took it further to say that we are God’s gift to each other. We are supposed to bring out he best in each other, our gift and our job. Nice Father Fred keep talking! Well, I have a few hours to work on the corn before our celebratory trip to the big city. Rototilling today to get ready to plant the red clover cover crop. Oh yea, no walk this afternoon, sorry, next one tomorrow at 0900. 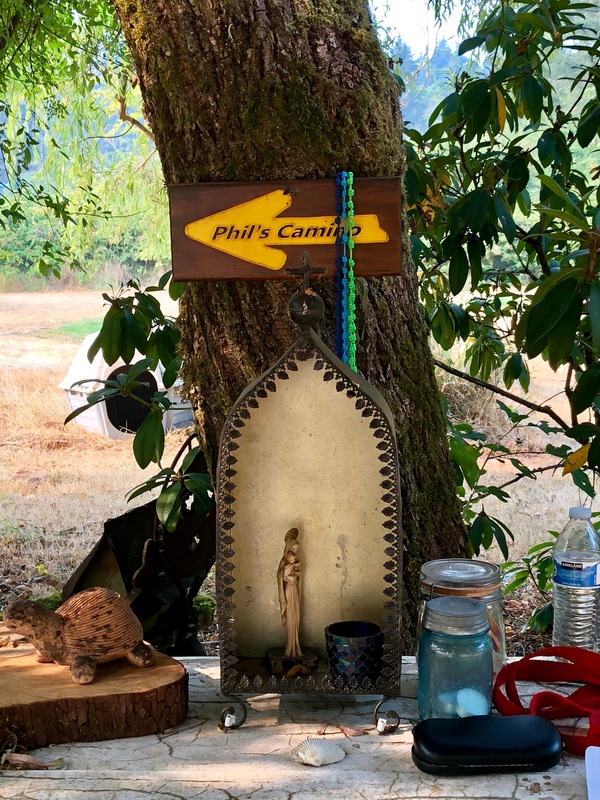 Yes, here we are September 22, 2018 and we have the first random sighting of a Phil’s Camino patch on the Camino de Santiago. There in the MON (Middle of Nowhere) of outback Spain. Felipe is so randomly happy! Looks like the Meseta to me. That’s Mary on the left, one of our neighbors here on the Island. Small world! 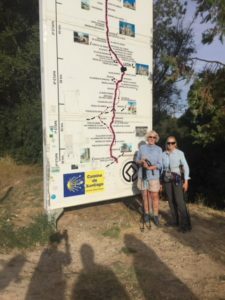 Steve-O sent an email to me enthused about the expanded versions of the Camino that we have been talking about here in the last few days. He calls it Camino-X. And we in our conversation realized how close we are to having the Camino be talked about as a state of mind. Now I hope that doesn’t offend anyone but think about it but I think there is a fit there. We who are fortunate enough to realize that it is possible to keep the flame burning are growing in numbers. This I think is the real lesson of the notion, “That once you get to Santiago your Camino begins.” It’s happening! Have to go and get things started for the day. Happening loves, Felipe.